One of the biggest sporting extravaganzas of the country, the 6th Dr BR Ambedkar World Cup Kabbadi today began with a great pomp and show as the Punjab Chief Minister Parkash Singh Badal accompanied by Deputy Chief Minister Sukhbir Singh Badal, inaugurated this mega sporting event here at Nehru Stadium.The Chief Minister and Deputy Chief Minister after unfurling the Kabaddi flag, took salute from the impressive march past from the captains of the participating teams. The Deputy Chief Minister also had interaction with the captains of the participating teams on the dais.Announcing the opening of this fortnight long much awaited gala sporting event till November 17, the Chief Minister said that in this mega event 11 teams in men section and eight teams in the women section would vie for the title. Pertinently 11 teams including India, Argentina, United States of America, England, Canada, Australia, Iran, Sweden, Tanzania, Kenya and Sierra Leone would vie for men title whereas in Women section eight teams including that of India, Sieraa Leone, Kenya, United States of America, Mexico, Tanzania, New Zealand and Sri Lanka would clash for the title. Addressing the gathering, the Chief Minister said that the state government has been making all out efforts for promoting sports across the state to channelize the unbounded energy of youth in a positive manner. He said that the sports policy of the state government was a right step towards this direction as it provides jobs along with monetary benefits to the outstanding players of the state. Mr. Badal said that this sports policy had given a major fillip to the sporting activity in the state adding that due to persistent efforts of the state government the sports persons of the state would bring laurels for the country.The Chief Minister said that as a tribute to the founding father of our constitution Bharat Ratna Dr BR Ambedkar the state government has dedicated this cup to his 125th birth Anniversary. Paying rich tributes to Dr. Ambedkar, Mr. Badal described him as a great scholar, jurist, economist, social reformer and a statesman. He said that Dr Ambedkar was one of the most towering personalities in the entire world history. The Chief Minister said that though Dr. Ambedkar hailed from a humble family but his outstanding contribution has brought him in the league of global leaders adding that even United Nations Organisation (UNO) was celebrating the 125th birth anniversary of this great Indian leader. He said that Indian Constitution was an outcome of Dr. Ambedkar’s hard work, dedication and vision adding that Babasaheb was not only leader of weaker sections but he represented the entire humanity.Congratulating Deputy Chief Minister for organizing this world cup for the sixth consecutive term, the Chief Minister said that Mr. Sukhbir Singh Badal deserves kudos for transforming the mother game of Punjab-kabaddi from a rural sport to a global event. He said that it was a matter of great pride for them that this game was now equally popular in nations across the globe, a glaring example of which was the presence of a number of foreign teams in the tournament. Mr. Badal said that due to the stupendous efforts of the state government the game has already became famous even in those countries, which had not even heard about it. “Above all, the concerted efforts to bring Kabaddi at a centre stage of world and reviving its lost glory in a short span are really laudable”, he added. Listing the efforts made by the state government for promoting sports in the state, the Chief Minister said that state government was leaving no stone unturned to popularize games in Punjab. Mr. Badal said that eminent sportspersons, who have brought laurels for the state were being given government jobs adding that many players who have won medals in different international sports have been appointed DSPs. The Chief Minister formally declared the sixth Dr BR Ambedkar World Cup Kabaddi tournament open amidst the thunderous applause from the audience.Earlier addressing the audience, the Punjab Deputy Chief Minister Mr. Sukhbir Singh Badal, while emphasizing the importance of kabaddi, said that the SAD-BJP government undertook several measures to make the sport reach dazzling heights of glory as traditionally the Punjabis share a deep emotional bond with the game. He also said that sports occupy a very important place in every society as only those societies tend to progress which channelizes the energy of its youth towards the sporting arena. Listing the sports centric initiatives promulgated by the state government, the Deputy Chief Minister said that the government revolutionized the sports infrastructure and constructed 10 astroturf hockey stadia in the state besides a world class institution called the Punjab Institute of Sports (PIS) in Mohali where 5000 budding players are being trained free of cost in various sports with the assistance of expert coaches and the state of the art machinery and their educational and dietary needs are also taken care of very well. Elaborating more, the Deputy Chief Minister said that the SAD-BJP government has opened a sports school apart from distributing gyms and sports kits in the rural areas so as to inspire more and more youth to take up sports.He expressed strong hope that everyone would enjoy the world kabaddi cup and be a link in further popularizing the game. Earlier, the Deputy Chief Minister took round of the stadium in an open jeep and also met the players from all the participating teams. 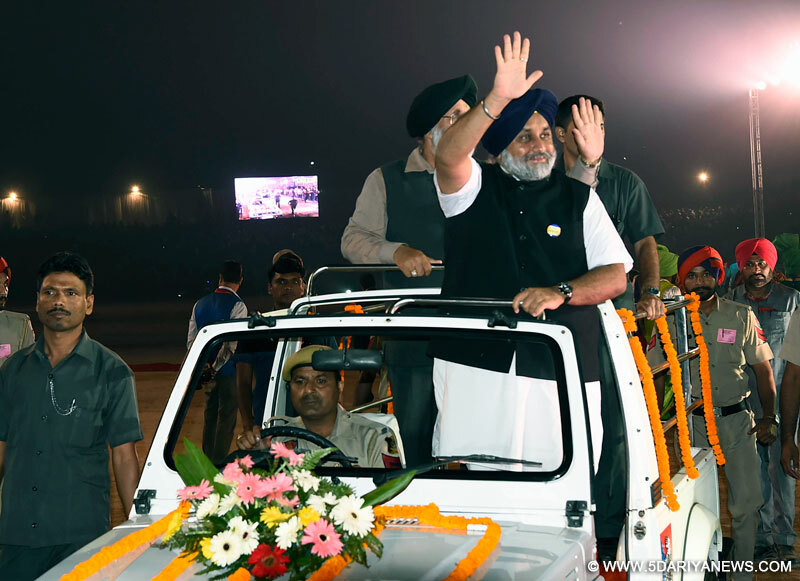 Welcoming the Chief Minister and Deputy Chief Minister, Cabinet Minister Dr. Daljeet Singh Cheema in his address thanked Mr. Sukhbir Singh Badal for fulfilling his promise of inaugurating this mega event from this historic town. He said that the residents of this town were indebted to the state government for choosing this place for the gala event.The star attraction of the tournament Nooran Sisters mesmerized the audience with their scintillating performance. Likewise, Punjabi singers Mrs. Jaspinder Narula, Mr. Gippy Grewal and Mr. Sharry Maan along with ace Comedian Ms. Bharti Singh entertained the audience.Earlier, Olympian Mr. Rajpal Singh, Golden Queen of Athletics from Punjab Ms. Mandeep Kaur and Kabaddi Icon Gurpreet Singh lit the flame to mark the inauguration this mega event.On the occasion the impressive video show depicting the overall development of the state accompanied by the traditional dance ‘Bhangra’ enthralled the audience and forced them to tap their feet. Likewise the gathering also cheered the highlights of the previous world Cup Kabaddi tournaments shown in the stadium. On the occasion Sri Lankan Petroleum Minister Mr. Chandima Veerkoti was the special guest. Prominent amongst other present on the occasion included Rajya Sabha MPs Mr Sukhdev Singh Dhindsa and Mr Balwinder Singh Bhunder, former President of SGPC Jathedar Kirpal Singh Badungar, MLA Chaudhary Nand Lal, Advisor to Deputy Chief Minister Mr. Manjinder Singh Sirsa, Special Principal Secretary to Chief Minister and Commissioner Ropar Division Dr S Karunaraju, Special Principal Secretary to Deputy Chief Minister Mr. Manvesh Singh Sidhu, Inspector General of Police Mr. Paramraj Singh Umranangal, Deputy Inspector General of Police Mr. GS Sandhu, Deputy Commissioner Mr. Karnesh Sharma and Senior Superintendent of Police Mr. Varinder Pal Singh.